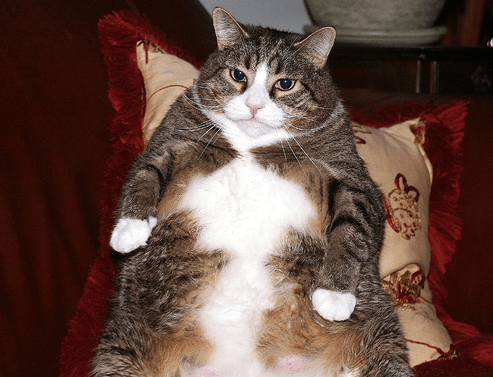 If you read the “news” this morning, the IMF is cutting its US growth forecast, the ECB is going to end QE, and 1 in 3 pets in America are obese. What, of any of that “news”, do you believe? And our predictive tracking algos have the IMF dead wrong at +2.1% US GDP growth (we have it accelerating to +2.69% and +2.99% year-over-year growth in Q417 and Q118). Whoever thinks the ECB is going to “end QE” is just ignorant of Reflation’s Rollover. Yeah, tell me what you really think KM. What I think is that a lot of people who haven’t been Long Real Growth vs. Short Reflation are having performance problems right now and they need to think long and hard about how they’ll be positioned for the 2nd half of 2017.
Who has confidence in our growth outlook? At least 2/3 of the people we met with in New York for the last 2 days weren’t outright disagreeing with our view, if only because the best strategist on Wall Street (Mr. Market) has the same view. My meetings are obviously a super small sample which could make me as ignorant as the IMF (who cut its growth forecasts at the literal bottom in US bond Yields last year and has missed this entire GDP acceleration). So how about the “confidence” of the masses? I get it. That’s “soft” data, and 33 month highs in both US Durable Goods and Capex growth is too hard for the bears to digest. That said, that’s what makes a market. 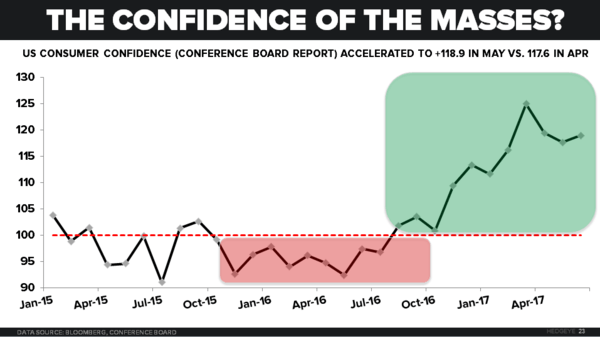 Being confident matters a lot less than being ignorant in contextualizing economic data. Instead of telling you how the market makes me “feel” (heck, some of my competitors give you a GDP forecast that “feels like 2%”, but I won’t go there), I feel absolutely nothing when the math in my model delivers me my daily risk range. We’ll review our #EuropeSlowing call on our Q3 Macro Themes Call on Friday (ping ) if you’d like to participate (we love taking your Q&A! ), but isn’t it interesting that Mr. Market might have already made his call? For context, inclusive of yesterday’s -0.8% correction, the SP500 is up +0.2% in the last month and the Russell 2000 is +1.5% (Biotech, IBB, is up +7.9% in the last month vs. Energy Stocks, XLE, down -3.7%). Yep, I left the -2.0% month-over-month decline in the Nasdaq until last just because I think it’s the most interesting debate right now. To buy or not to buy, the FANDAGO? Since we’ve told you to buy every damn dip in things like Tech and Biotech (even when it had negative price momentum) back in November of 2016, I’m staying with it, hopefully being patient enough to signal buy at the low-end of my risk ranges. And because I feel absolutely nothing about these tickers (they are simply price/volume/volatility signals with no political or “valuation” bias), both Dow Bro and NVDA are the closest to signaling buy (at the low-end of the range). As an independent research provider who aspires to get both the research and the “signals” right, there’s some serious ignorance in me signaling BUY on something like NVDA (which we don’t cover yet on the research team). But, I’m just a knucklehead-and-retired-hockey-player, don’t forget. That said, I have a lot of confidence in my risk management signaling process and ignorance has often been my life’s bliss.